We are all concerned about the $12.6 trillion federal debt, the IOU’s for which will be flooding in on us, our children and our grandchildren. When we and our elected representatives decide to stop wringing our collective hands about the problem and actually start doing something about it, what do we need to do? The problem is not really with things such as the $787 billion stimulus package of last year. Even its worst critics recognize that there is some return on that one time investment. No, the federal debt problem is not with the vast majority of the discretionary spending that always gets all of the headlines. The problem is with the big three contributors to the national debt year in and year out: social security, medicare/medicaid, and the defense budget. Leave those three sacred cows alone and you are doing little better than nothing to address the debt issue. Let’s look at the defense budget for now. The plain and simple fact is that domestic discretionary spending is an ever shrinking portion of overall federal spending, while defense spending, social security and medicare/medicaid continue to rise. Defense spending makes up 30% of the federal budget. Adding in social security and medicare/medicaid, the big three comprise 73% of the federal budget. How does America’s defense spending compare to the rest of the world? In 1989, the world spent 4% of its collective gross domestic product on defense spending. That has shrunken to just 2.43% of GDP in 2008. The United States alone, however, makes up 41.5% of the total world spending on defense, with China a very distant second at 5.8%. While the rest of the world has reduced its defense spending, in the past ten years U.S. military expenditures have increased 67%. By comparison, the United Nations has a total budget of $30 billion, with much of that going to peacekeeping missions. As of last year, however, U.N. dues-paying members were $829 million in arrears, of which the U.S. owed 93% of the overdue bills. With America bearing the brunt of military spending in the world, what does it get in return? Relative peace of mind? Hardly. In an index called the “Global Peace Index,” which measures the “peacefulness” of countries, the U.S. ranks 83rd in the world, right next to Kazakhstan (the top five most peaceful nations are New Zealand, Denmark, Norway, Iceland and Austria). Well, you may argue, America is fighting three wars right now, the “war on terror,” Iraq and Afghanistan. An analysis of the figures does not, however, support the proposition that the increase in Pentagon spending is due primarily to that factor. It is instead the rapid and recent 39% growth of regular defense spending unrelated to these three “wars” that makes up much of the increased defense spending. In the decade since 9/11, excluding the cost of the wars in Iraq and Afghanistan, the Pentagon budget has increased substantially faster than either social security or medicare/medicaid. Since America, ranked 83rd in peacefulness, is not the beneficiary of all of this spending, who is? 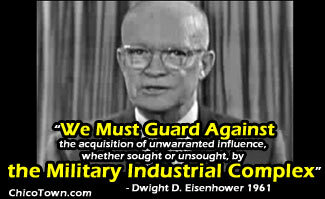 The military-industrial complex, about which President Eisenhower warned us back in 1961, is doing just fine, thank you. According to the Dow Jones U.S. Aerospace & Defense Index Fund, the industry has enjoyed a 170% increase in stock prices. In just a four day period a few weeks ago, Lockheed alone was awarded $836 million in new contracts by the Pentagon. So, quit worrying about a new education proposal that may cost $1 billion dollars. That’s a drop in the federal deficit bucket. In fact, over the past eight years, while spending on defense has climbed 9.1%, and social security and medicare has climbed 3.8%, all other discretionary spending (which includes education, highways, housing assistance, law enforcement, public health, air traffic safety, and all the other things we actually like about the federal government) rose only 1.3%, and is actually a shrinking percentage of our federal spending. We all support the troops. But do we have to continue to let a few defense companies help drive us deeper into federal debt? Want to tackle the public debt? Start taking aim at that huge defense budget or quit complaining. Trillions In Federal Deficits – Who’s To Blame? Less Government! No Deficit Spending! OK, How?